If the mid-term elections were held today, we now know how Pennsylvania voters would cast their ballots in key races, according to a new poll. NBC10's Lauren Mayk explains. Gov. 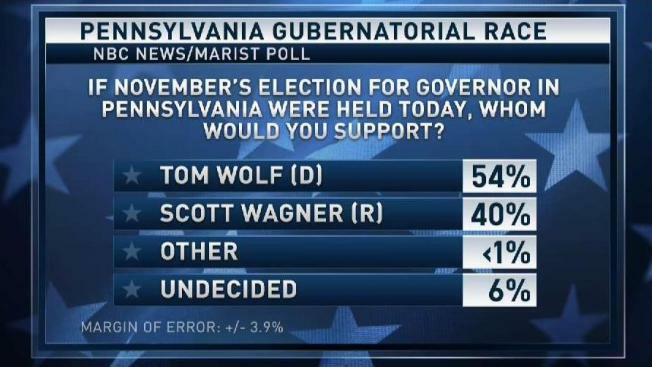 Tom Wolf holds a 14-point lead over challenger Scott Wagner. Sen. Bob Casey holds a 15-point lead over challenger Lou Barletta. The Republicans are challenged by name recognition as the races enter the final months before the Nov. 6 election. Pennsylvania Gov. Tom Wolf and U.S. Sen. Bob Casey hold commanding leads in their bids for re-election in November, thanks in part to favorable opinions among registered voters and low name recognition for their challengers, according to a new NBC News/Marist poll. The incumbent Democrats each have double-digit leads over their Republican challengers. Former state Sen. Scott Wagner is challenging Wolf, and U.S Rep. Lou Barletta is trying to unseat Casey. Wolf leads 54 to 40 over Wagner and Casey leads 53 to 38 over Barletta, according to the survey of 735 registered voters. It is the first poll released on the races in over two months. Both Republican challengers face steep uphill battles with less than three months to go before the Nov. 6 election, in large part because of considerably less name recognition and satisfactory job performance ratings for the incumbents. According to the poll, 51 percent of registered voters have a "favorable impression" of Wolf, compared to 39 percent who have an "unfavorable impression." For Casey, it's 48 percent favorable compared to 34 percent unfavorable. For Barletta, more voters have "never heard" of him than those who have an opinion of him, according to the poll. Forty-five percent of those polled are "unsure-never heard" of the congressman, compared to 30 percent who have a favorable opinion of him and 24 percent who view him unfavorably. The former mayor of Hazleton in northern Pennsylvania rose to prominence a decade ago as a hard-liner on immigration. President Donald Trump recently held a campaign rally for Barletta in Wilkes-Barre. Terry Madonna, a well-known pollster at Franklin and Marshall College, recently described Barletta as "Trump before Trump was Trump." Wagner, a wealthy businessman from the same region of the state as Wolf, has begun airing political ads on television but also remains unknown to nearly a third of the electorate. Both men come from York County, with Wolf a scion of a powerful local family and Wagner rising to prominence through his sanitation collection company. Thirty percent of registered voters said they are unsure or never heard of him, compared to 36 percent who have a favorable impression and 34 who have an unfavorable impression. In both races, nearly nine of 10 registered voters said they are likely not to change their vote between now and Election Day. Both top-of-the-ballot races could play crucial roles in how the two major parties do down-ticket. Pennsylvania's 18 congressional seats are considered crucial in helping decide whether Republicans will hold onto control of the U.S. House or Democrats will take back power. A hotly-contested, but now settled, fight over the state's congressional map ended in a drastic redrawing of the 18 districts. The political fallout resulted in a few incumbents dropping out, and a wide range of outcomes possible Nov. 6. Republicans currently hold 13 of the 18 seats, but Democrats are hoping they can wrest back a few seats. Some speculation has arisen that the current makeup of the Pennsylvania delegation could swing 180 degrees. Voters' opinion of Trump will go a long away to deciding which scenario plays out in the fall. The president won Pennsylvania by less than 1 point, even though registered Democrats outnumber registered Republicans by 800,000. Despite his close victory over Hillary Clinton less than two years ago, Trump is now viewed more unfavorably by registered voters, the Marist/NBC News poll found. Can Trump Rescue Barletta's Chances? When asked, "Overall, do you have a favorable or unfavorable impression of Donald Trump," registered voters skewed 56 percent unfavorable to 35 percent favorable. The survey of 825 adults was conducted Aug. 12-16, 2018, by The Marist Poll, and sponsored and funded in partnership with NBC News. Results are statistically significant within 3.9 percentage points. CORRECTION: This story has been updated to correct the date of the election.